Abrasion Resistant Materials P/L (A.R.M*) manufactures Tungsten Carbide Hardfacing utilising proprietary welding techniques to apply Tungsten Carbide to various wear parts, like dragline adapters. This creates an alternative maintenance management strategy that reduces costs by improving the standard of performance typically experienced with cast wear parts and plate style wear parts. Mr. Tim Falkenhagen, Managing Director of A.R.M* explains - "The previous experience gained during my years running construction site maintenance of large fleets of heavy equipment allows a certain understanding of the problems that occur when operating in abrasive mine sites. I remember having to change ripper boots every 15 minutes on a 455 Komatsu that was trying to rip cemented Limestone. It's this depth of experience which makes it easier to assess the particular problem and to often change the part shapes to a better wearing shape which ensure we deliver cost reducing options." This intuitive understanding of on-site challenges combined with an exceptional product has enabled A.R.M* to service the mining sector for 20 x years - in the process becoming one of the largest manufacturers of Tungsten Carbide Hardfacing in Australia. The recent completion of a new purpose built factory – where we have 5 x semi-automatic A.R.M* Hardfacing systems operating – combined with our licensee (North Qld. Hardfacing), who also operates 3 x A.R.M* welding units – then one can see that we have the capacity to service the mining industry on a large scale - and also have the ability to grow. While we are 100 percent focused on delivering premium quality Tungsten Carbide Hardfacing products we are also interested in other innovations that can lead to cost reductions for our customers. As an example, our grader blades using an ARM60 alloy are proving to be superior to all other options in iron ore haul road maintenance. "Our commitment to product quality and customer service is perhaps best demonstrated by the fact that we have never lost a wear life trial and I don't see that changing either unless diamonds suddenly become the same price as Tungsten Carbide." As the manufacturer of a premium Tungsten Carbide Hardfacing, we continue to innovate and set higher standards in terms of both wear rates and overall cost reductions. One example is where we changed the tip to adapter wear ratio on one Dragline from 5:1 to over 30:1.This has delivered around $80,000 p.a. in cost reductions at one coal mine with one Dragline. The multiplier effect here is obvious. When you lower the replacement part consumption rate (by increasing the total wear life of critical components) the whole maintenance equation begins to change in area's like : the number of maintenance staff required, warehouse inventory stock on hand, freight costs, equipment productivity, equipment availability, the number of big ticket items like buckets required to shift say 14.0 Million BCM p.a. So put simply, reduce the change out frequency of wear parts with A.R.M* Hardfacing and cost reductions happen. Implementing the A.R.M* Maintenance Strategy is not difficult, because you only need to make two decisions. 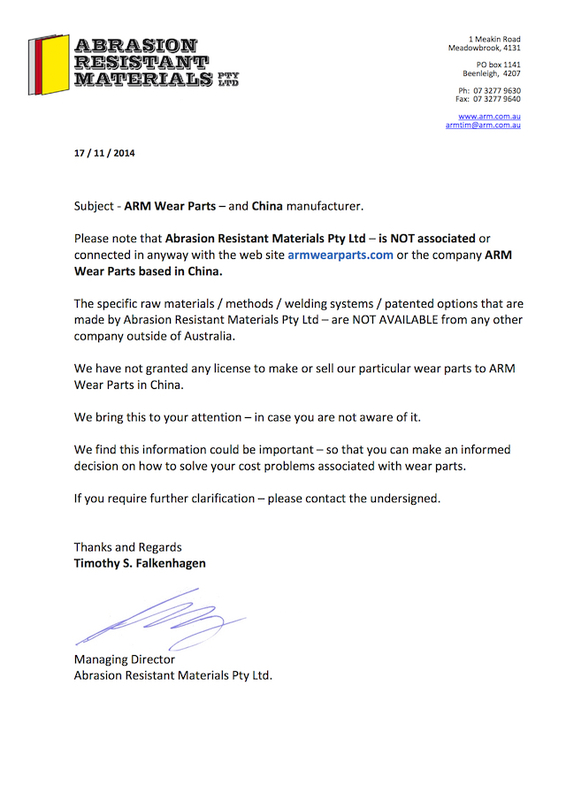 First, change the specification for purchase orders on high cost / large volume wear parts to the A.R.M* Hardfaced option. This could include : large bulldozer cutting edges, grader blades , face shovel tips , wheel loader bucket parts & Dragline bucket wear parts. Then second - select the particular A.R.M* option that suits your needs. Whether this is for hard rock mining, underground mining or even bucket wheel excavator tips . Many of these parts are also common between mine sites like the 16H/M serrated cutting edges or the V81 series face shovel tips. Make these two decisions and GET costs will be reduced. We have proven this many times in applications like : coal mines, quarries, dredges , sugar mills, gold mines, iron ore mines, hammer mills , compactors for road building and the list goes on. Dragline bucket wear packages (Patented) that last three years and 20 million BCM. Here we invented : New Adaptors / New Heel Wear packages / New options for bucket tips – all of which create the opportunity to go from a 3 x bucket site strategy down to a 2 x bucket strategy. Dragline Chain – that now lasts double the life of the Standard chain – for only a 50% cost increase for A.R.M* HF – from new. Grader blades (Patented) where we have increased the life of 24M grader edges – from an average life of 316 hours – up to 2000 hours. Shovel Bucket Adaptors – that last 18 x times longer – in Iron Ore.
Abrasion Resistant Materials Company Policy Documents.